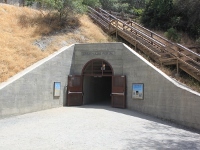 The Greathouse Portal is the entrance to the underground visitor center. Admission: Charge for parking on weekends and holidays. 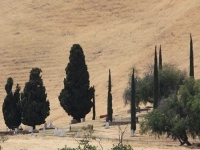 From 1860 to 1906, this area was the largest coal mining district in California. Five towns (Nortonville, Sommersville, Stewarville, Judsonville, and West Hartley) grew up around twelve major mines. Today the towns are gone, the buildings having been moved to nearby communities after the mines closed. 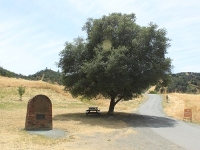 Mine openings, tailings, railroad beds, and a pioneer cemetery are being preserved by the East Bay Regional Park District. 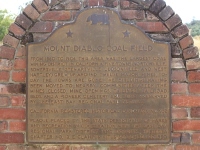 Official state marker plaque just south of the parking lot at the south end of Sommersville Road. 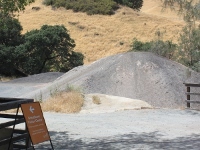 Tailings piles (waste material excavated from the mine) near the Greathouse Portal.